A few months back I wrote up a review post of the Bloom CSP trial pack I purchased during #RUMPS week. You can find it here. I got the mighty, the maxi and the midi Nora’s to try and they’re so pretty! They have a bright white PUL backing edged in lusciously soft microfibre to prevent leaks. They feature a delicate floral pattern mirroring the Bloom pads but are a stark contrast to Bloom’s black and bold design. Aesthetically they’re both very pleasing to look at, which is always nice. I still can’t decide which is my favourite but you’ll definitely have a “cycle with style” with either of these pads! As ever, when trying out a new pad I was more than little excited for my period to arrive. I have very few “white” topped pads so that took a few goes to get to used to. I think the clash of red and white is visually quite severe and I have to confess I personally prefer a coloured topping on my pads – I don’t know why, I just do – it’s silly really, after all it’s perfectly natural! During use the Nora held in place nicely just like the Bloom. They have poppers so you can get a really secure fit. They are slightly thicker than most pads I’ve used but on my heavy days I’m actually reassured by a heftier pad. No leaks to report, which is always a bonus and the mighty held up overnight. I’m going to order one more of each the Bloom & Nora mighty pads as they are such a good fit for me. They’re the only brand so far that’s held up overnight! I have to confess at first I didn’t notice the difference between the Bloom’s Bamboo and Nora’s microfibre topping. There was no irritation and it sat lovely against my skin. However, towards the end of my cycle when my flows tapers off I really did notice and it was great. That awkward phase a lot of women go through where you’re not quite finished but need more than a liner can often feel quite uncomfortable. I often feel more aware of my pads during this stage. Not with Nora. The stay dry topping was so much nicer on my skin. I didn’t have that awkward uncomfortable feeling at all. Total game changer! I didn’t have any worries or encounter any problems using the cold tap to rinse off the pads. Most stains lifted immediately which was reassuring to see. Then I popped my used ones in the next washing load and they all came out stain free, squeaky clean and bright. I love that now I can completely tailor my pads to suit my flow. I can start off with maxi Bloom for when I’m at my heaviest, use Bloom or Nora mighty overnight for ultimate protection then swap back to Nora maxi and midi as my cycle ends for maximum comfort and use a mini as and when needed. Perfect, I’m really glad I got to try both! Bloom & Nora is the sister company to TotsBots, a well respected reusable nappy brand, which is what led me to them in the first place! 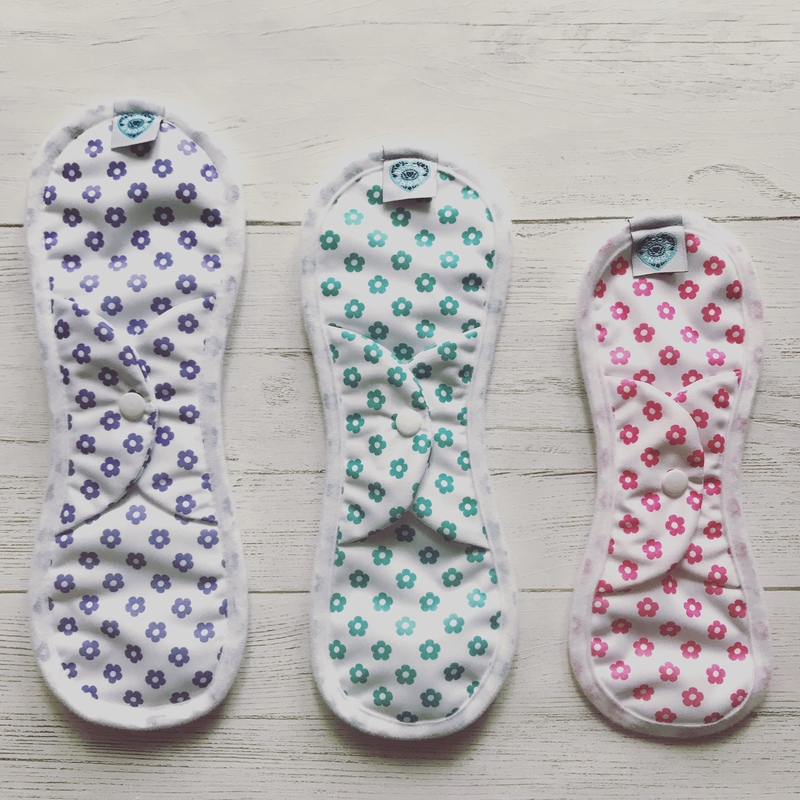 They sell both the Bloom & Nora pads as individual sizes, multi packs, trial packs, full cycle packs and even gifts sets if you need a little from “me to me” pick me up! They also stock a range of wet bags which I can highly recommend. I have the out and about one which is ideal as it has separate compartments for clean and dirty. It’s very discreet too. You can find Bloom & Nora here and they have amazing customer service too. Any questions please get in touch with them on 0141 774 6437 or email them directly through their website. I completely agree with their ethics, CSP is better for your skin, your purse and the planet. Every woman should have a cycle with style! Oh to be young !